When I think of Spaghetti aglio e olio I remember that I really was on a kick when once vacationing in South Tyrol.While South Tyrol belongs to Italy as the most northern province it also gained self-governing over the last few decades. It has a very strong regional culture. The most common first languages there are German, Italian and as a minority Ladin is also accepted (Ladin is a Romanic dialect). Typical food in the Tyrol area is a mixture between Alps and classic Italian cuisine. It’s definitely one of those interesting places not only in a culinary way when different cultures come together and develop into a community. 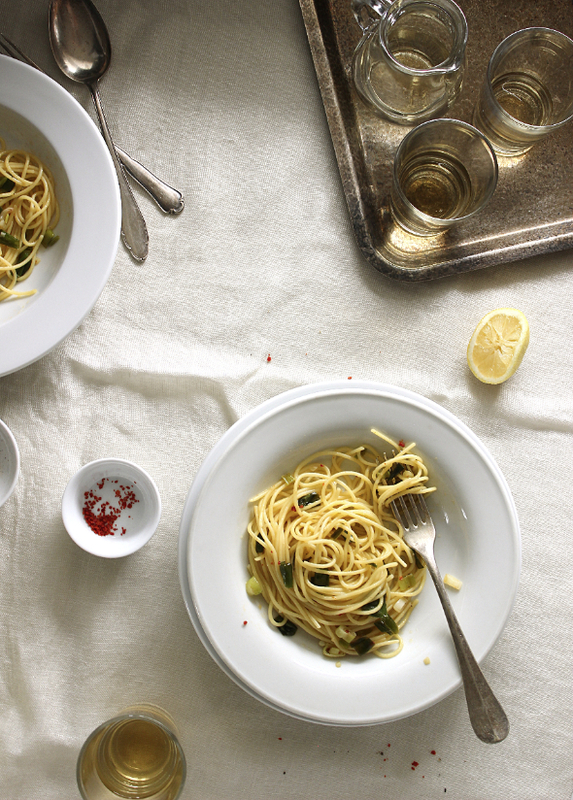 The great thing about this classic dish is that it uses very few and simple ingredients a lot of us easily have as staple such as spaghetti, garlic and olive oil. Oftentimes the classic version is topped with some chopped fresh parsley. This recipe version features sautéed scallions. It fits very well and adds some bite. Ground red chili peppers are also part of the recipe as they do add dimension and depending on the amount some heat. 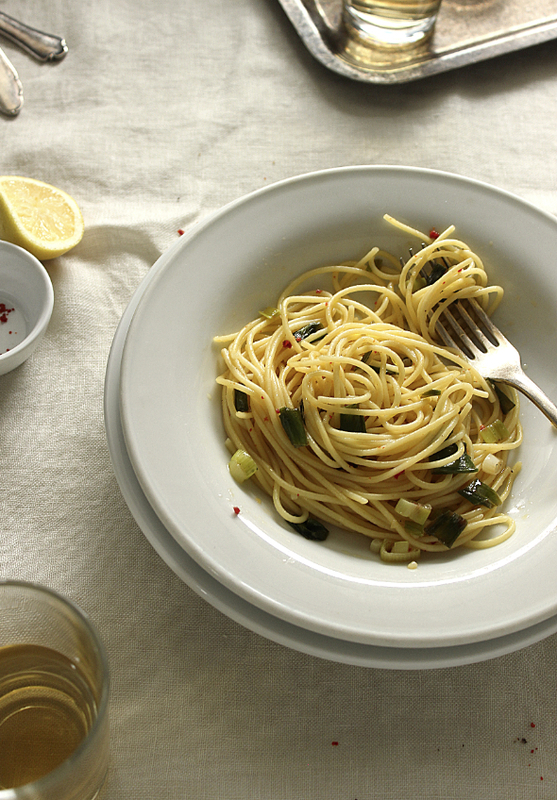 Technically this recipe is called spaghetti aglio, olio, peperoncino e cipollotto (if I’m not mistaken). Bring a pot of water (about 3l) to a boil then add 2 ts salt. Meanwhile heat a skillet on medium high with olive oil, then add scallions, stir and turn down heat to medium. Let scallions become translucent and slightly browned for about 4-5 minutes. Stir occasionally. Season your scallions with salt, pepper and red pepper flakes and stir to combine. Now temporarily take the skillet from the heat and add minced garlic. Stir so garlic gets coated with oil before adding skillet back to the heat and everything becomes garlicky fragrant for about two minutes. Simultaneously add spaghetti in the boiling water, stir immediately and cook until almost al dente and then drain. 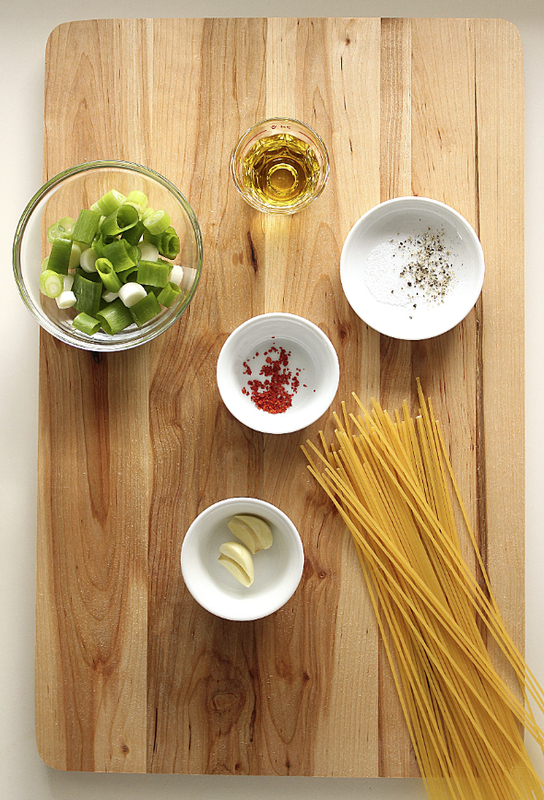 Add drained spaghetti to skillet with garlic-oil sauce and mix to combine everything before serving. 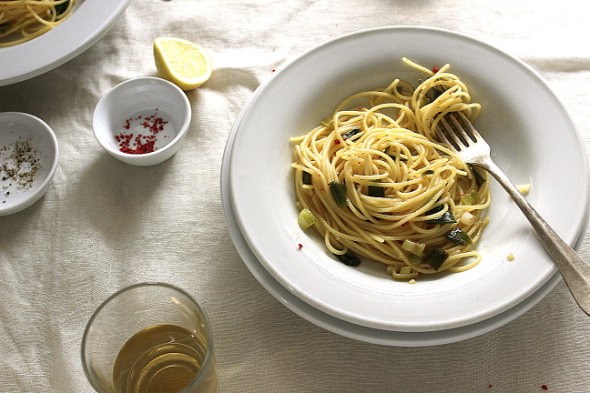 Use gluten-free spaghetti for gluten-free version. The Usual (cutting board, chef’s knife).